Designed to enable cyclists to hear what’s going on in their surroundings more clearly by blocking out wind noise, the Helmet Angel is a wind-deflecting shell that attaches to the strap of the cyclist’s helmet. The product’s unique design will also help to combat the earache that many cyclists suffer during longer rides. 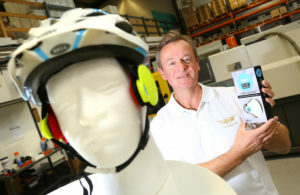 A keen cyclist himself, the idea for the Helmet Angel came to David, a flooring company owner, when he was forced from his bike during a ride back in 1992 when a truck came alongside him at close range. “I didn’t even hear it coming!” David explained. “I was cycling downhill on a stretch of country road when a truck which was trying to overtake me suddenly appeared at my shoulder. Because I hadn’t heard it coming, it spooked me and caused me to move over onto the gravel at the side of the road, at which point, I lost control of my front wheel and fell onto the bank side. “The truck itself never actually touched me, but the fact that I did not hear it approaching until I caught sight of it right alongside me caused me to fall. “At the time the incident happened, I was working at a carpet factory where you had to wear earplugs while on site due to the noise levels. I began adapting these earplugs to try to create something that would deflect wind noise while riding my bike. It wasn’t until I became a father to Hannah and Aidan, who live in Holland where helmets are not a priority, then later, my daughter Elia, that I decided to press on with the idea and create the Helmet Angel.